On November 17, 2103, we received a photograph of an RCMP grave marker which is located in the Hatley Memorial Gardens in Colwood British Columbia. 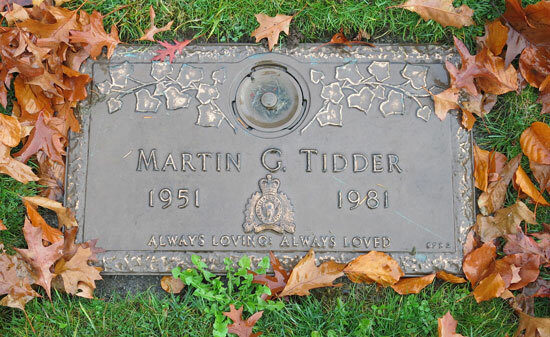 The grave marker is in the name of Martin G. Tidder. However, there is no listing for him as a regular member of the Force nor is there any reference to him in any of the obituaries in the RCMP Quarterly magazine. No listing in the RCMP Gravesite database. Apparently on April 3, 1981, he slid down an aluminum roof and fell to the ground landing on his head. He died on April 5, 1981 in Vancouver General Hospital from multiple fractures of the skull. 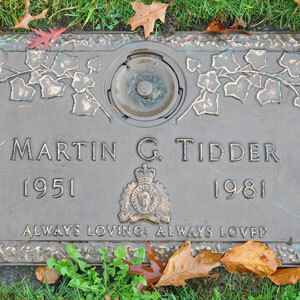 Martin Tidder may have been an RCMP Civilian Member or an RCMP Auxiliary Member.